TIME IS IT REALLY ON YOUR SIDE? Many of us tend to put things aside thinking we will get to it later on and for most later on never happens. The same goes with a budget and our finances because we might not want to face what we will uncover once we start digging through the paperwork. Facing up to reality is the hardest part of getting started when budgeting and getting your finances in order but that is the way we all had to start. Finding out where you stand and how much you are worth is just a stepping stone for what lurks ahead. 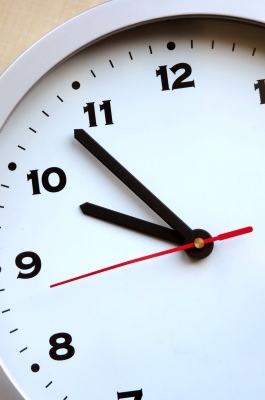 Time is never on your side when it comes to finance because every day that we put off what we should have done the day before is lost and we can never get back. We are now in the home stretch for 2014 starting the month of December in hopes that by the end of the month we can look back over the 2013 and congratulate ourselves for accomplishing many of our goals and then set new goals for 2014. I read something on instagram the other day and said something like “Get out of bed and get going because what you put off today will be forgotten tomorrow” and that my friends is the honest truth. Every day something new comes up in our lives and keeps adding to the pile of “things to do” so set yourself some time to get your financial house in order. If you want to start a 2014 budget start the prep work now and download my free excel budget spreadsheet so you are ready to go for the new year. Know your numbers inside out, know the facts, set goals and make your 2014 the best year you can financially. As you can see we had quite a reasonable month in November. Problem was the not exactly great earnings on our investments were thankfully compensated for by the ever-increasing Pound Sterling to Canadian Dollar exchange rate. From a horrible low of £1 = $1.52 to a reasonable $1.74 as of 10th Dec 2013 a very slow increase has suddenly picked up over the last 2 months. I’ve researched a little bit into the cause of this sudden change of fortune but didn’t find any one specific cause. It turns out that the UK is coming out of the recession it was once in and has posted larger than forecast growth figures over the past 3 months. There are other factors in play here and I can pretty much guarantee that tight government spending habits have helped a little. I’m sure none of us are out of the woods yet as regards the financial crisis, but there is hope on the horizon. I will certainly keep an eye on the exchange rate, but inevitably the money will still have to be pulled to pay off the remaining mortgage before the end of the term next year. Still, some good news has come out of keeping our money in place and not just pulling it in fear that it may go down further. At a rate of $1.52 our money was worth $61,643.60 but now it has increased to $70,768.48, which is a gain of $9,124.88. That’s not bad considering we haven’t done a thing with it yet. I don’t think we would have saved that amount pulling the money early and paying off the mortgage sooner. Figuring out net worth is fairly easy as long as you know your personal numbers or monthly finances. Net Worth is simply adding up all your assets (what you own) then taking away your liabilities (what you owe) which will give you a net worth number. Understanding your net worth will help you determine if you are on track to meeting or beating your personal financial goals. It doesn’t get any easier than that. Now you can stop asking yourself, how do you find out your net worth because it’s easy to determine. To pay off our mortgage with-in the 5 yr term ending in April 2014- Update: Money has been moved to my bank account now I have to transfer it to Canada. Focus on our tax free savings accounts (TFSA) and other investing- will look at this once the mortgage is paid in full. To sow and grow more vegetables/herbs in the garden to save money- garden is done for the season. To take vacation somewhere in Ontario for summer 2014- planning this now! To Read a new Personal Finance Book- working on this, slowly..very slow as my time gets eaten up almost every day. Learn more about SEO and Blogging- I’m always learning something new but it’s all beneficial and has helped Canadian Budget Binder grow the way that it has. To finish renovating our home- Landscaping is pretty much completed as of the end of September. Next is bathrooms. To continue with educational training to further careers- More training for me coming up in December then who knows what the new year brings me. To save money for big renovations- I’m starting to tear out the bathrooms and measuring up the kitchen to purchase new cabinets and counter tops and do a full makeover. When budgeting anything is possible, we are proof of that although we still have a long way to go in our journey. These are our numbers and our goals, not a means of comparison towards your own goals. We don’t care how much money others make or if their net worth is lower or higher as it’s not a competition. I hope our experiences perhaps will help guide you along your financial path working towards debt freedom. Not everyone has the same path in life. Some of you may have had to start over like I did or go to school a second time and now have OSAP loans to pay back. Others may have divorced, lost money in the stock market or other investments, lost a job, fell ill and so on but you can’t let that stop you, I didn’t. Some of you may have been given trust funds, paid-for homes, paid educations or perks in life that give you a financial kick-start and that’s OK too. 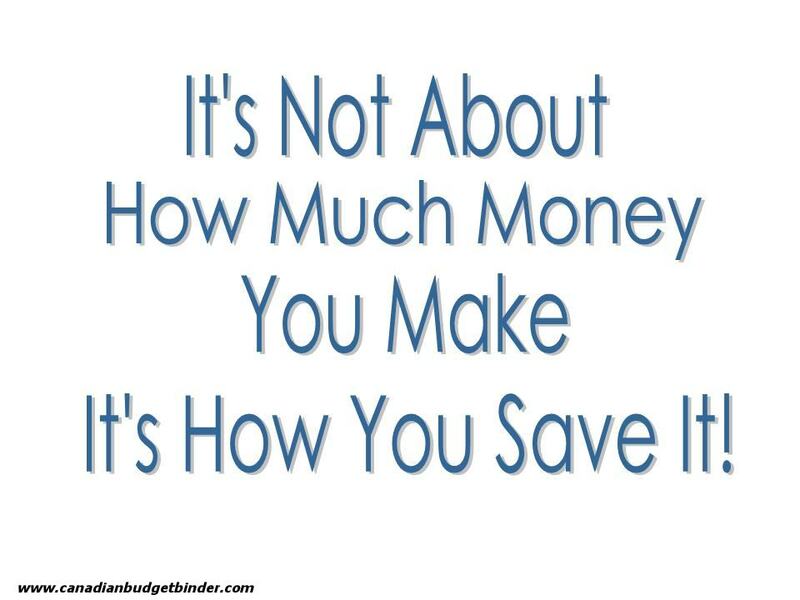 Remember what I said, “It’s not about how much money you make, it’s how you save it”. Focus on you and don’t let the evil eye of money jealousy or keeping up with the Joneses cloud your vision. No one cares about your money as much as you do so don’t waste your energy trying. The only reason people accumulate wealth is because they know how to save or invest it wisely even if they did inherit money or win the lottery. The smallest improvements should mean big strides in working towards reaching your goals. Sometimes we have to fail in order to learn and we’ve all been there. Money can be an evil force for some people especially those who are negative towards their own situation. I urge you to be optimistic and little by little with determination you too should see improvements, that is if you want that to happen. We are always looking for ways how to increase our savings and by tracking our net worth these numbers below show us how well we are doing or what areas we should put a bit more focus in. 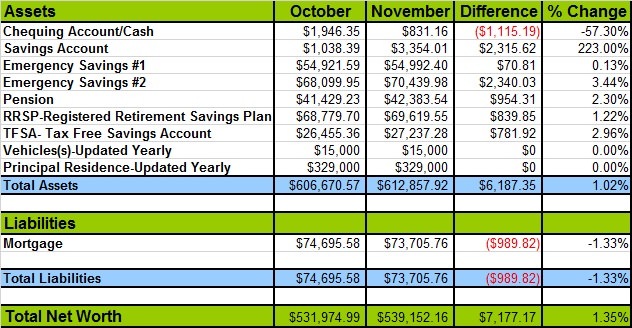 Overall: November was on ok month although we did spend a bit more than normal since it the last couple of months of the year when we break the budget for Christmas although most of the money is already saved in our projected expenses. The vehicles also require maintenance this time of year and we have been spending a bit more money on clothes in 2013 than anticipated. All of our final numbers will be looked at next month so we can devise a new plan and budget with realistic numbers based on the 2013 facts we will have gathered. NW over $500k is great! Not sure what mine is actually?? When one of those two things change, then I will investigate more. It sounds like you have everything under control. I’d be more worried if I was swimming in debt and not getting out or struggling but you’re well ahead of yourself. It looks good for getting a decent return on the money from back home to pay off the mortgage!!! Always a good thing!!! We finally heard about the older boy’s application for CPP-D and I can work that figure into the budget. The younger boy put his name into the new place opening in town at the old Dana plant so if he can get in there that will be added one way or another as well. Hubby is stable right now, for how long we don’t know, but I’ll take it now. The boys know they have to help as hubby can’t work and I’m caregiver. Also the only licensed driver at this point. The older boy worked his magic so I can work from your budget pages so we shall see where we go from here. Your numbers are looking good going into year end and that’s the way to have it. Much better than our numbers but it’s a new year and I’m hopeful things go better than last year… i have a few things to work out for next years budget so we shall see where I can take things…. 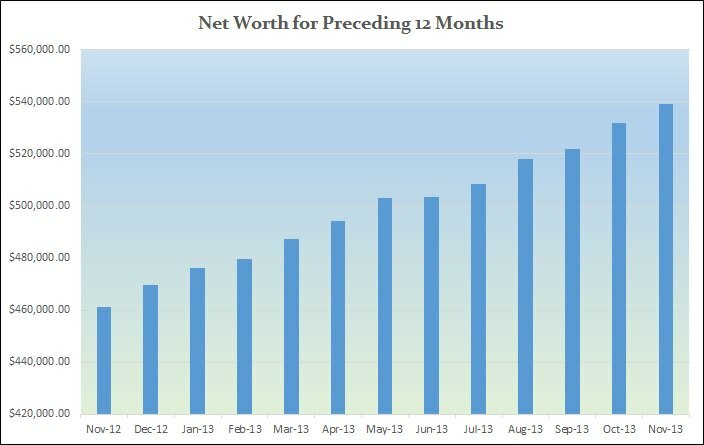 I love the months of June and December as it’s the two times out of the year I choose to check out my net worth. Looks like you’ve been doing great. It always feels good to see +%’s month by month instead of negatives. It’s amazing how much of an impact the exchange rate has had for you guys. I think it’s great that you’ve been so level-headed about it and haven’t made any rash decisions out of fear. Once you have all your money in one currency, I think it’ll be a nice stress reliever. Oh Jen… you have the tools and the knowledge to reach your goals. You know what you have to do and remember we all had to start from somewhere. We weren’t given any money we started from zero! 🙂 Smile.. I’m always around if you need me.